Whether you’re writing a novel, a blog, or an essay, the biggest problem has to be writer’s block. It’s so annoying when you’ve actually gotten past the initial procrastination hurdle (not an easy task in itself), you’re sat at your desk and you WANT to write – but it’s just not coming out. Or, what is coming out isn’t to your liking. Trust me, I know how that feels; I started this blog post in 2005. Here are a few tips you can try to give your creativity a little boost. 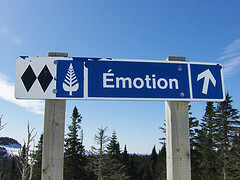 Our emotions serve evolutionarily adapted purposes. We have different emotions because they each solve different evolutionary problems. Anger helps to stop people transgressing against us, love helps us keep a mate, fear keeps us out of danger, and so on. Because they are specialised, emotions have different effects on our perceptual system, and the ways we think. ‘Negative’ emotions tend to narrow our though-action repertoire, while ‘positive’ emotions tend to broaden them (Fredrickson, 2001 – PDF). In other words, when you’re in a lower mood, you’re more likely to look at the little details, when your mood is high, you’re see the bigger picture and be more creative. So whenever you’re brainstorming or coming up with new ideas, boost your mood with something uplifting, heart warming, or side-splitting. I like this. Whenever you’re editing or proof-reading, put some downbeat music on, and get to work. Whenever you’re doing work that requires focused, mental effort, you’re draining your mental willpower reserves. Once these are depleted, performance suffers and you suddenly can’t be bothered to work. Take regular breaks and do something that requires no effort to attend to – spending time in nature has proven to be a useful exercise to this end (See the extensive work of the Kaplans). Also, make sure you don’t go hungry while working – the fuel that willpower runs on is glucose (Gailliot and Baumeister, 2007) – empty stomach equals poorer mental performance. Short answer: If you want a novel idea, expose your brain to novelty. Long answer: The area of the brain associated with novelty is thought to be the substantia nigra/ventral tegmental area (SN/VTA). The VTA is part of the dopamine system, in other words, the reward system. When we perceive novelty, our brain signals us to explore, because it is always looking for rewards. The brain likes novelty. What’s more, these brain areas are connected to the hippocampus, which is involved in learning. You can see where I’m going with this; enhanced learning might occur in the context of novelty. On top of that, a novel environment exposes you to a different set of priming, which themselves trigger different areas in your brain. There’s the science, here’s the simple advice – go somewhere new to write. Try a park, a library, a coffee shop you’ve never been to. Try a car park, a zoo, a big wheel, try wearing different clothes, talking to different people. Use novelty to your advantage and see if your brain doesn’t come up with some new ideas. Luciano Passuello of LiteMind discusses the SCAMPER method of creative problem solving. This is going to be more effective when you have a specific writing problem you are ‘stuck’ on. It is essentially a list of questions which help you to look at the problem from 7 different angles, each represented by the SCAMPER acronym. Not all of these angles will be appropriate to your specific writing problem, but I’ve found it really useful at various times. I’m interested to hear how you get on with this method, so let me know if you use it – leave a comment with your experiences! I’m certain that by using one or more or these techniques (all four if necessary) you’ll be able to make at least SOME headway on your writing. Let me know how you get on! From my personal experience I learned, when my mind is blocked it is usually because of some event I decided not to deal with. For example a conflict with my spouse, the bad feeling I have for not cleaning the gutter, or whatever it is, it is blocking my free flow of thoughts. Write everything down I think. Everything means really everything. I write about how the food was today, how the weather is, that I feel bad about not cleaning the gutter, etc. At some point I have nothing left blocking my mind and this is usually when the most creative ides emerge. Another thing, doing housework for 2 hours does wonders for my motivation to get back to writing. Really good ideas there vergleich, cheers! Emotions really affect about the idea that comes out in our mind. Some people write article because they want to express their feelings. But if you want to write an article that are something nice to read don’t write if your are on bad mood coz it really affect the outcome. I read the SCAMER method, and I would say that this is very helpful to those who want to improve their writing skills. .-= Charlotte DWI´s last blog ..Hello world! =-. 4. have a few plants in the room. A natural environment makes the air nice so that your brain can operate better.